Monitor Your Purchases, Your Van Stocks and Control Your Warehouse All in One Place. For a 14-Day Free Trial, click here! A Full Featured Stock Management System Designed to Manage and Streamline Your Entire Business from Start to End. Eworks can offer you a simplified way to manage where your stock is or has been. Easily manage what you have in stock, what has been committed to jobs in progress and what you have available. That way, you know what you still need to get for upcoming jobs. Using Eworks to manage and monitor each location means that stock replenishment becomes an easy task. With total stock and stock value for each location visible, your staff know exactly what stock each warehouse or mobile location has - minimising over stock and understocking. Whether ordering stock for a job or for a location, you can keep an eye on all purchase order information. 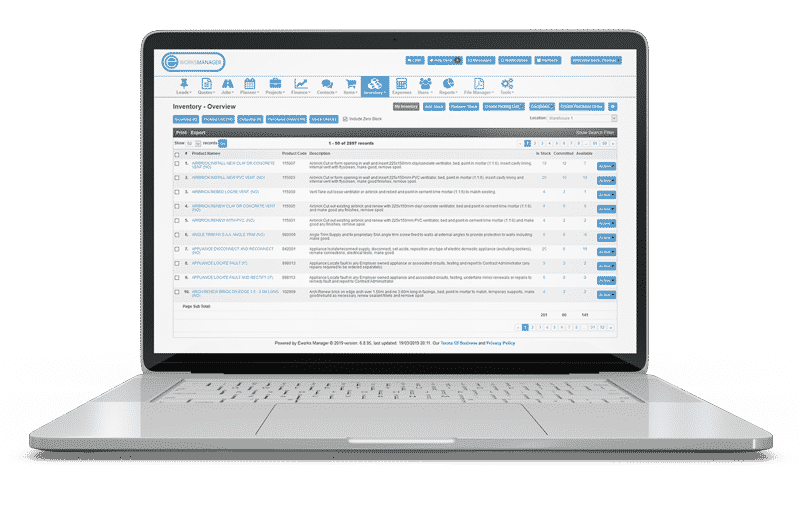 With Eworks’ Stock Management System you can capture partial deliveries and invoices from your suppliers, ensuring you have all the stock you ordered. Tracking stock you have ordered also becomes easy when you can simply select the location from a drop down which automatically updates that locations stock count. When stock assigned to a job is not available in the workers van, the system will automatically generate a picking list for the worker to go and collect from their designated warehouse. The admin staff can easily create picking lists to move stock from one location to another, that way the system can adjust stock values for each location and keep a full history of stock moved. When picking lists are created for locations, when stock is ordered from your suppliers or when staff add or remove stock for specific locations Eworks keeps a full history of it. This allows you to refer back if any issues arise around stock. Manage all your van stock and top up as required. Easily purchase new stock from low levels and for job specific requirements. Monitor what is being used and who is using it.